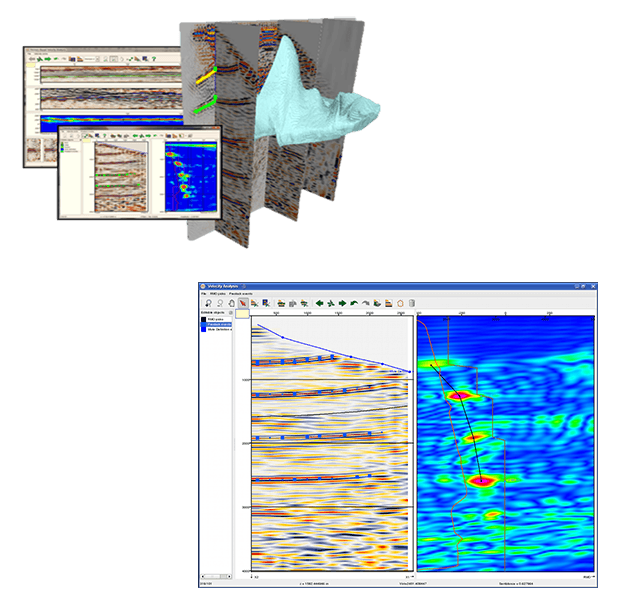 Working in the upstream oil and gas industry we provide software engineering and geoscience services. Build velocity models from pre-stack data in vertical update and horizon-consistent update modules. The VMB plugin is used for picking RMO (and NMO) velocities from migrated pre-stack gathers. RMO velocities are used to update the (3D) velocity model in PSDM work flows. Apart from picking velocities on semblance gathers VMB also supports picking anisotropy parameters eta, epsilon and delta and picking of pre-stack events that serve as input to the PSDM-Tomographic plugin. Two VMB modules are supported: vertical update and horizon-consistent update. The actual creation of velocity models is performed in OpendTect’s Volume Builder, which is released in the open source part of the system. Models are constructed from combinations of gridded / smoothed RMO velocities, interval velocities and 3D body velocities. VMB is designed to support multiple PSDM systems. All structures needed to interface a PSDM system to OpendTect’s VMB are released in the Open Source domain. Take a look at this fantastic new video on our YouTube Channel, explaining just how helpful our INPEFA plug-in for Petrel is when you are correlating your wells! We're having fun making new developments to XField - just finishing up our MATLAB prototype to add Butterworth filters to our real-time filtering functionality!